Look who's crawling all the way to grandma's house! The cutest Little Red Riding Hood you could imagine! But don't keep her waiting, because she's got an important play date to keep with Granny that she simply cannot be late for! 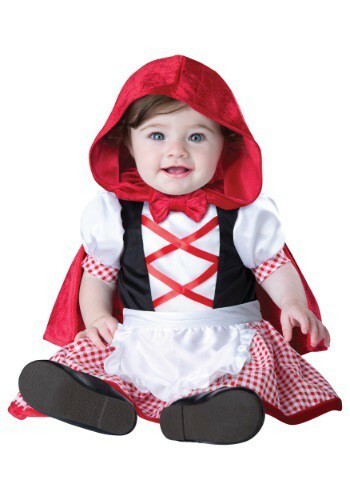 Dress her up in this precious looking Little Red Riding Hood Costume, and she'll be all ready to play when she gets there! This little red riding cutie doesn't even have time to worry about big bad wolves or carrying a basket stuffed with treats to share with grandma (that's your job, mom and dad), so she should be all ready to show off her pretty new storybook style by the time you arrive. But she must not keep grandma waiting, because if she's late to play, then she'll be late for the post-playtime nap. And then if she's late for that, she'll also be late for her after-nap cookies and treats, and then there will be trouble that will make a bad wolf look sweet by comparison! Actually, as long as she gets to snuggle in this adorable little costume, there probably won't be too much fuss. And who wouldn't want to cuddle up with this little fairy tale cutie in her comfy one piece gingham patterned romper, with its attached apron and the matching red hooded cape?? No grandfolks will be able to resist her in this precious look!